New York will mark its third annual Russian-American history month in April and May. Featuring a series of exciting events, including concerts, Lermontov readings and a spring ball, the celebration promises to transport some of the wonders of Russian culture to the Big Apple. 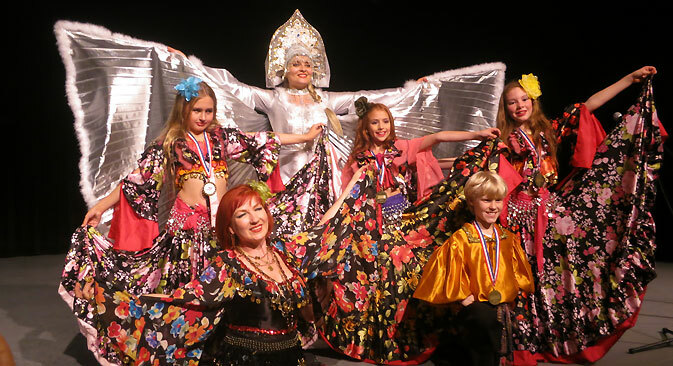 In April and May of this year, New York will celebrate its third annual Russian-American history month, featuring a series of exciting events that transports some of the wonders of Russian culture to this metropolitan isle. The initial efforts to launch this commemorative month came from the Russian-American Cultural Heritage Center (RACH-C), which celebrates its tenth anniversary this year. They first approached the local senator with the idea, who then brought the resolution to the Senate in Albany for a vote. It passed smoothly, and now (with the help of a coalition of over fifty sponsors), New Yorkers can enjoy this cultural feast each year. April 22 - Tour of the Synod of Bishops of the Russian Orthodox Church Outside of Russia (Cathedral of Our Lady of the Sign). The tour (in English and Russian) will be conducted by Prince Vladimir Kirillovich Galitzine, recently retired Starosta of the Cathedral. April 24 - History Tour of the St. Nicholas Cathedral Father Alexander Golubov, gives a tour of the building's history and architectural innovations. April 27 - Annual Russian Orthodox Easter Picnic. For her, establishing a Russian-American history month was especially significant on a symbolic level because it would officially indicate that Russian-Americans have always had- and continue to have- a real impact in America. It would also serve as an entertaining way of introducing Russian culture to those who know little about it. In alignment with their goals, the month’s impressive calendar presents subjects that are at once familiar and illuminating, beloved and obscure. The upcoming bicentennial celebration of Mikhail Lermontov on April 19 at the Mid-Manhattan Library will include readings and lectures on the 19th-century Russian poet who is so revered in his home country and yet relatively unknown here. On an even more highbrow note, The Spring Ball of the Russian-American Nobility Center at The Grand Ballroom of the Pierre Hotel (taking place on May 9) promises to be an elegant affair that will enable participants to mingle, dine, and dance with real Russian aristocracy. Tickets include a cocktail reception, a sumptuous meal, and traditional ballroom dancing to the music of the Alex Donner Orchestra, Alex Juskin and the Kalinka Orchestra, and the Barynya Dance Ensemble. In addition to being the highlight of any White Russian social calendar, this will be an excellent opportunity to live out any Anna Karenina fantasies one may have. The Young Musicians in Concert series at the Lincoln Center will showcase young prodigies from all over the world performing beloved pieces from both the classic and contemporary repertoire on May 14. All of these gifted children were discovered by the Vladimir Spivakov International Charity Foundation and later became winners of international competitions, so this is the chance to see all the new Mozarts and Tchaikovskys of the world before they grow up. And of course the Children’s Festival at the NYU Skirball Performance Center, taking place on May 17, which is also the closing event, will feature exceptionally talented (and adorable) children’s groups performing traditional Russian folk songs that range from melancholy odes to the moon, to gypsy dances around campfires, to Cossack marches, to poignant World War II waltzes, all while dressed in the colorful traditional garb of these different Russian ethnic and historical groups. It will also give people the chance to buy those beautiful hand-painted wooden spoons and hand-woven, dramatically long shawls which no home can do without. Although it varies from one event to another, Olga estimates that the audience for these events is usually roughly 60 percent Russian and 40 percent American. Julio Rodriguez, who is a co-founder of the RACH-C and a longtime appreciator of Russian culture, especially enjoys seeing the impact these events have on identity formation. "These events are so much fun, and every year I learn something here that surprises me,” he said over the phone. “But what I enjoy most is seeing these American kids growing up and still preserving their culture, because culture is the mirror to which we look to find ourselves, and for many of the people in America, especially in New York, there’s more than one mirror involved." And indeed, one of the main purposes of the Russian-American history month is not only to help people learn more about a culture that is either familiar or unknown, but also to show that culture itself is what unites us on a fundamental level as human beings. That’s why, when asked whether or not the current tense geopolitical situation in Russia has been providing special challenges this year, it was no surprise that Olga responded with a resounding no.